Went though the rest of the website and finished changing the columns to the new layout. Some pages still need some updating but it should at least be legible now. I'm still not sold on this layout but it will do until I find something I like better. I was somewhat attached to the old layout but that website was a holdover from -wait for it- Yahoo! Geocities. It was pretty ancient and needed updating. Unfortunetly I'm not a web developer so this will have to do. The space theme clashes a bit though, might need a more extensive website update! I have a rather large boardgame project that's nearing completion I haven't added to the website yet. I'll get to it eventually. For the first time in something like 10 years I decided to redo the website theme and layout. I liked the simplicity of the old one, but time for a change. Went with the more "mechanical" victorian feel this time around. Some pages on this website may look odd, some text may be unreadable and the like until I finish converting all the content over. Might be a while. It's not bad. A little slow, requires two dice to be rolled per point of damage. Still trying to see if I can use something like the RL: Leviathans system. I like that one but it's proving hard to adapt the concepts. Started a new game concept. It's a solo-designed WWII tactical game, with a focus on armoured combat detail and a semi-intelligent "AI" player. Details can be found on the sidebar under "World War Solo" (working title). Re-wrote the Warfleet background. Basically the same story but a little more flushed out. Redid the starmap using actual stellar cartography and created a more consistent timeline. The new background page is up, starmap will be up shortly, and over the next week I will be updating the various other pages to reflect the updated backstory and cartography. Added a new faction.. the "Harvesters". Not intended to be a major faction. I just had an idea for a different type of ship design that I thought fit in well here. They're a minor faction of scavangers and salvagers. Not exactly aggressive, but not friendly either. You can read the limited info on them on the "Pirate Factions" page. 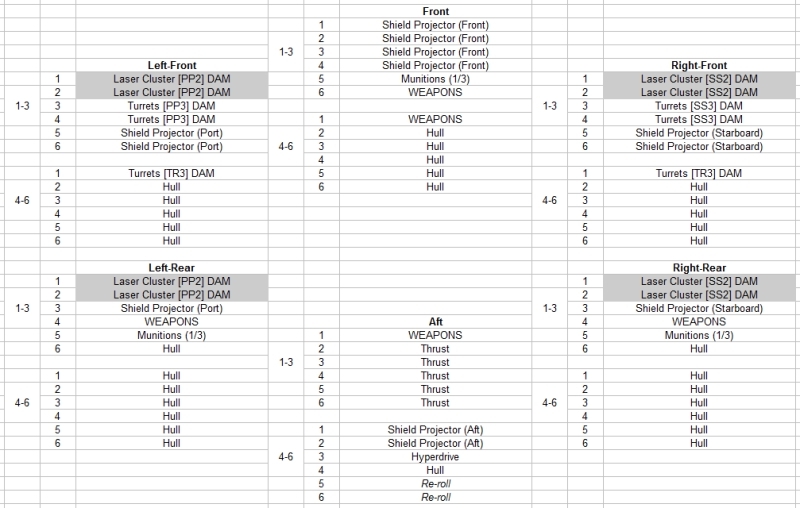 Devised a new damage system for Warfleet and thus Starmada. Haven't quite playtested it to see how it flows, but mathematically and thematically it works out. It reminds me a lot of the system originally used in Battletech. ...has been yea... non-existent. Started doing a bit of planning on a new, updated version of 100 Days in Oradon (working title). Trying to make it more like a traditional PnP RPG while allowing for fun and paperwork-light solo play. It's going to take a bit of doing but it should be a fun rehash. I took some time off work to do a cert and ended up spending a good deal of time on Warfleet. Finally got around to creating a large amount of the initial ship designs in Starmada... then realised I messed up on one of the weapon traits. Damn. Now I have to re-do most of them. Oh well. I think I'm going to change my design philosophy slightly and stop trying to peg designs into specific hull sizes, instead actually design the ships to the roles I envisioned for them. So this will be 'take 3' of the ships for Warfleet!